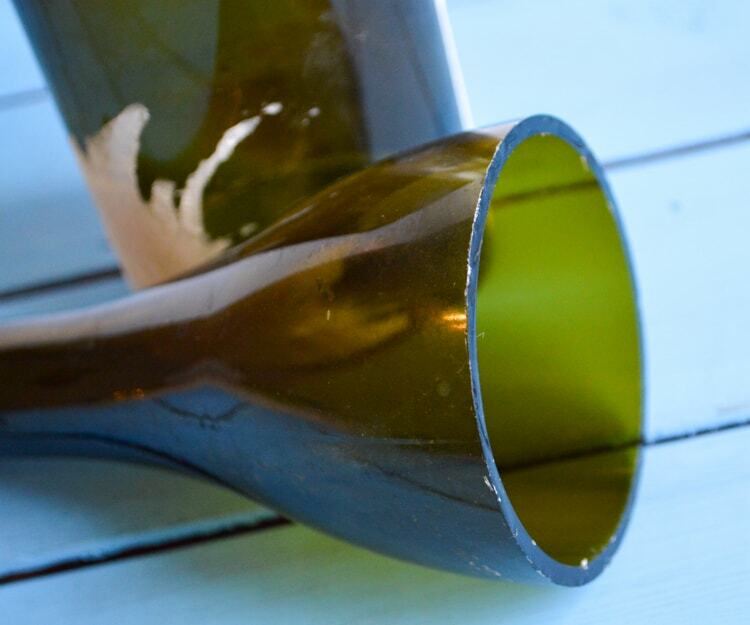 Have you seen all those cool upcycled wine bottle projects on the internet? 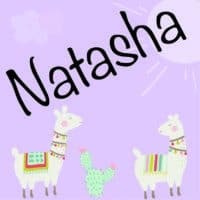 Torches, lanterns, wind chimes, candle covers, glasses – the list goes on and on. How about those Pins saying you can just soak some string in acetone, wrap it around the bottle, light it up and, voila! cut bottle? 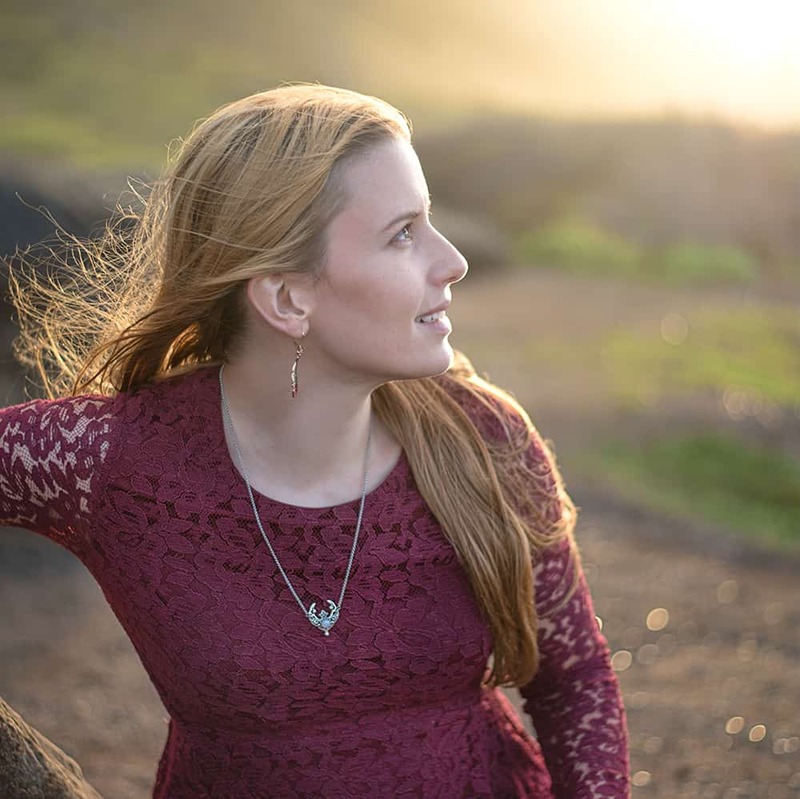 Ever heard the saying “If it seems too good to be true…”? Yeah… That method doesn’t exactly work! 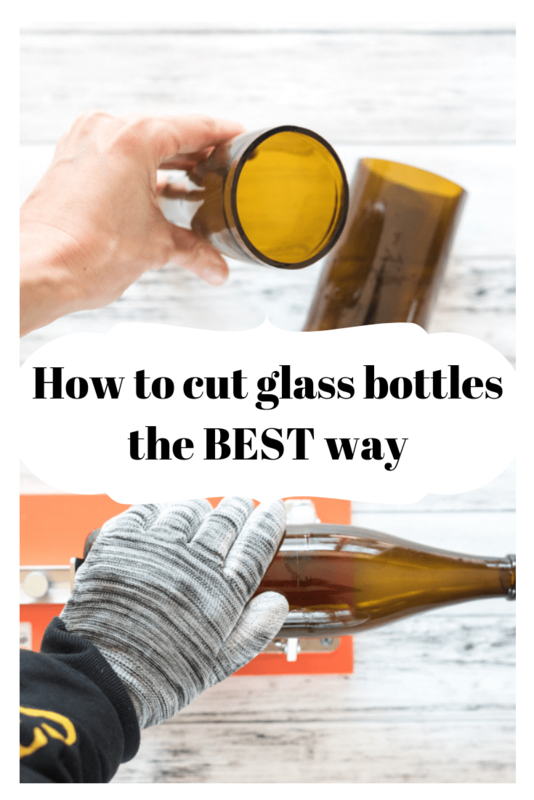 Today I’m sharing how to cut glass bottles the best way so that you can get nice, clean cuts and save yourself the trial and error I went through! I started trying to cut glass bottles several years ago. I quickly learned that the string/yarn method doesn’t really work. Maybe someone out there has gotten it to work, but it never, ever worked for me. Next I tried the glass cutter + butane torch method. This brought a sort of success, but I could tell the torch was stressing out the glass and I ended up cracking a lot of the bottles during the cutting process. I don’t know what sort of success rate I was looking at, exactly, but it was poor enough I stopped taking labels off the bottles before attempting to cut them. Then I tried the dipping in boiling water and iced water baths…again, lots of stress on the glass and plenty of fractured bottles. Then I came across the best way to cut glass bottles with the highest rate of success. 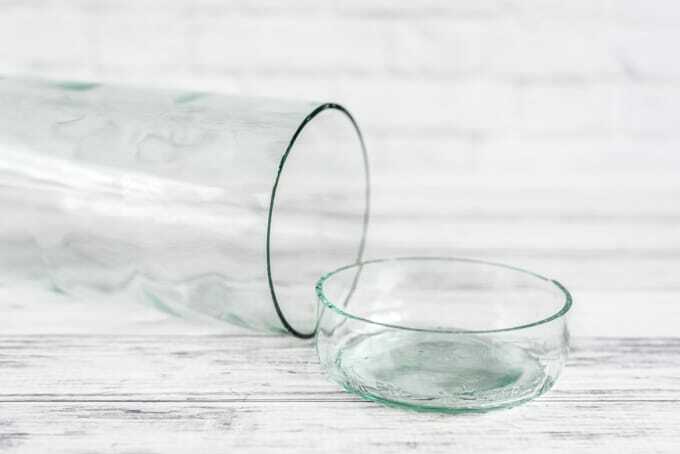 Using your glass cutter with a rig to hold it in place, some nearly boiling water, and water straight from your tap, you can easily achieve fantastic cuts. Awesome! Just read on to learn how! 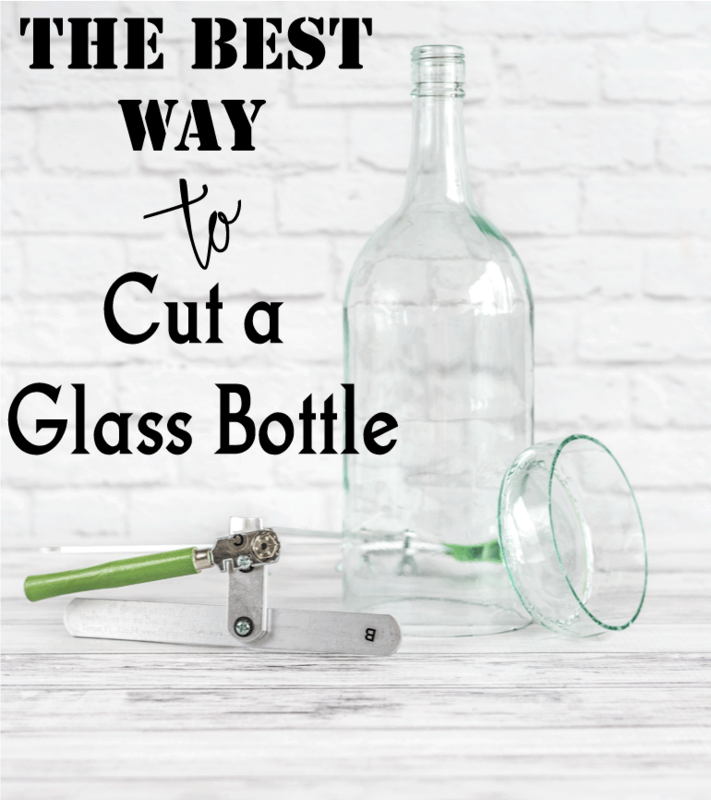 What do you need to cut a glass bottle? 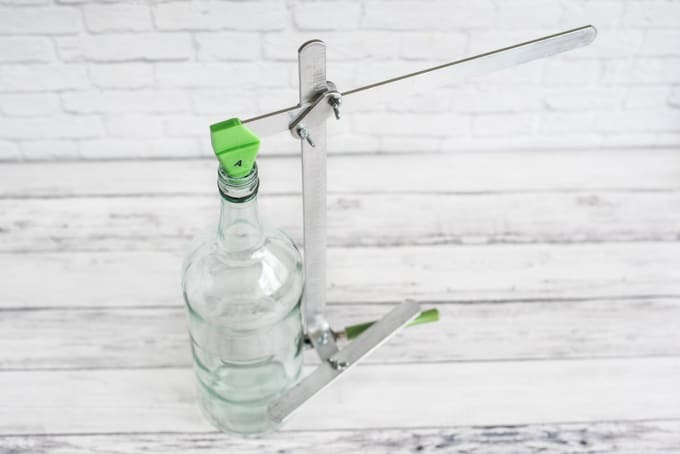 A glass cutter with a rig for cutting bottle. A representative from Home Pro Shop bottle cutter recently invited me to try their product and it is amazing! I previously used the Generation Green g2 and the Home Pro Shop model makes much cleaner cuts and is easier to use. Cut proof gloves. Optional, but a good idea! The Home Pro Shop glass cutter comes with a pair! A large bowl to hold ice water (optional). I’ve found you can frequently use cold tap water, but you can also use an ice bath. 1. Make sure your bottle is clean. 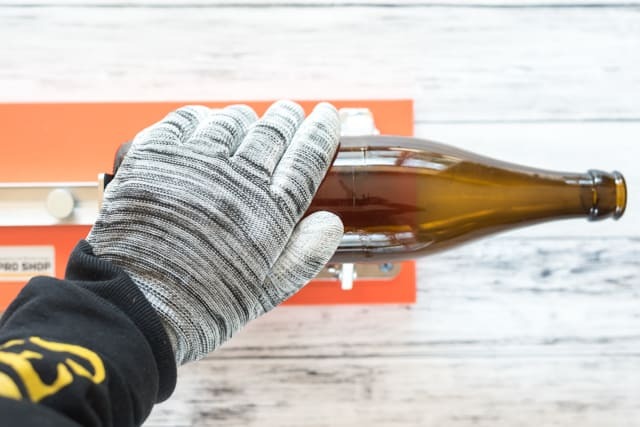 Any dirt or grit on the bottle will mess with the cutter! 2. 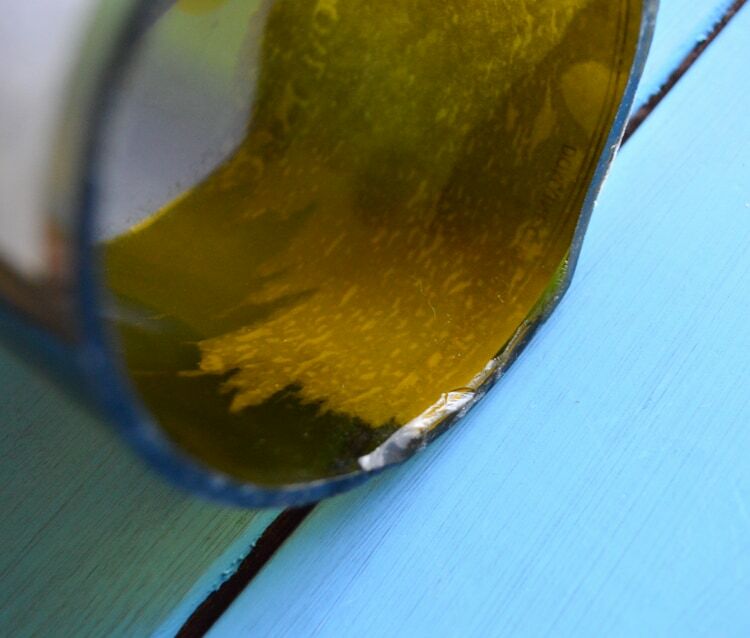 Use your glass cutter to make a light, even score all the way around the bottle. Apply firm, even pressure all the way around, but don’t press down too hard. You might want to press down on the cutter, but this really isn’t necessary. 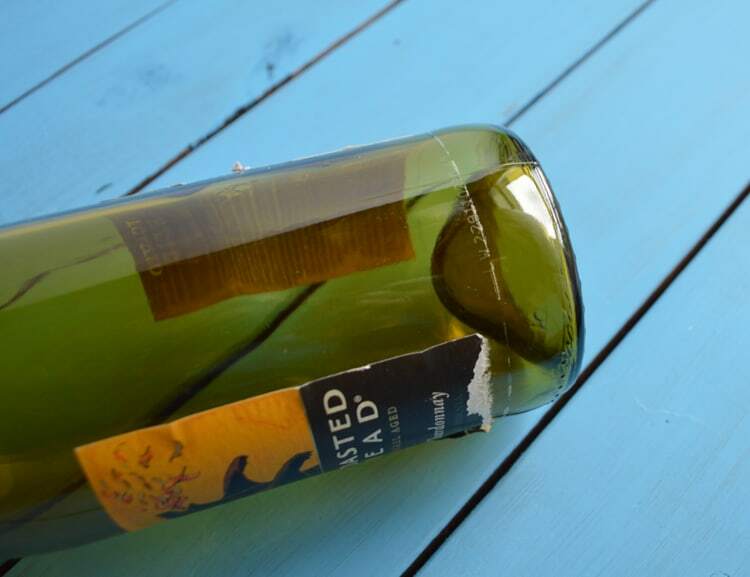 Also, make sure you only cut exactly once around – repeat passes are not helpful can make it more likely the bottle will crack instead of cut! Your glass cutter should have more detailed instructions on its operation. This is the Home Pro Shop bottle cutter. 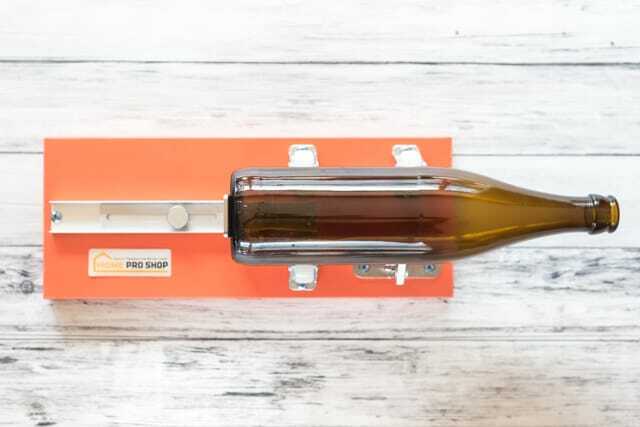 As you can tell looking at the base with the wheels and the firm backstop to hold the bottle in place, it is far easier to get a reliable cut with this cutter. 3. Bring your pot or kettle of water to a boil and then remove it from the heat. You don’t want to pour boiling water on the bottle or it may crack unevenly, or even shatter! You can also pull the water before it’s quite boiling instead of letting it sit to cool down. 4. Put on your eye protection (seriously, please don’t skip this part!) and carefully pour a slow, steady stream of hot water onto your score mark while turning the bottle. If your pot is too unwieldy, carefully dip a Pyrex measuring cup into the water to dip some out and use that, instead. Keep pouring water, slowly rotating the bottle, this until you notice the bottle becoming warm in your hand. 5. Immediately run the bottle under ‘cold’ water from the faucet. This water doesn’t need to be actually cold – ice water can shock the glass too badly. Just use the regular, not heated tap on your faucet. You should notice the score mark is easier to see, thicker, and probably somewhat white. You may even start to hear a crackling noise! 6. Repeat the hot water/cold water process another two or three times, or until the bottle cracks open along the line. If it hasn’t separated after three tries or so, go ahead and bring out the ice water bath. The bottle shown below is freshly cut and not yet sanded. Isn’t that edge nice? 7. Be very careful when you handle the freshly-cut bottle pieces! They are extremely sharp and can cut you badly. To dull the edges, sand them carefully in a shallow dish filled with water or under running water. The Home Pro Shop kit comes with a full sized sheet of wet sanding paper, and you can buy more as needed at most hardware stores. Sanding under water is incredibly important because it traps the glass particles – you don’t want to breathe them in! 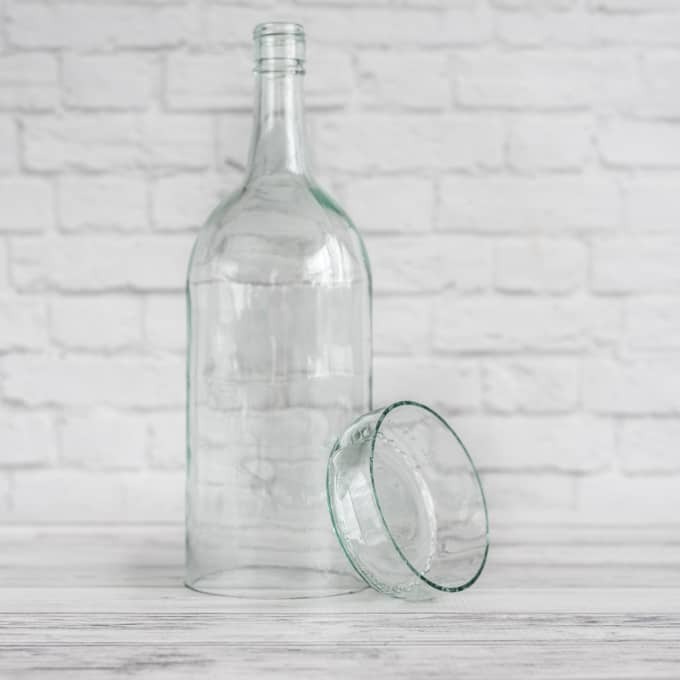 If you’re hoping to make glass bottle crafts to sell, you might end up needing to buy some empty wine bottles for uniformity’s sake. Luckily, they’re pretty easy to find in a variety of colors from home-brew suppliers! I really hope you enjoyed learning how to cut glass bottles the best way! What are you going to make with your cut bottles? I have doing a similar method and my last few attempts didn’t go so well. What is your thought on dipping the bottle in the hot water and then dipping in the cold water vs pouring hot water over the bottle and turning it. Last weekend, I had 1 out of 8 bottles have a clean cut and I am not sure if it was that I was cutting around the bottle more than once or too deep or that I wasn’t getting the glass hot enough by pouring the water over the bottle. I like pouring because it allows me to control the flow of water. I’ve personally had a lot of bottles crack when I tired dipping in hot water. It does usually take several back and forths with pouring, but I find the little bit of extra effort worth it! Getting a good cut is absolutely critical, though. You should barely be able to hear at the cut – just a slight cutting noise, not a loud crunching sound. I hope that’s at least a little bit helpful! I’m new to this game and I have literally just tried your method…worked a treat! Wasn’t sure what to expect, (didn’t ‘Youtube’ it) but it was painless and silent. I’m so glad this method worked for you! I’ve wasted far too many bottles with other cutting methods and I’m happy to help other people avoid the same frustrations!